Despite having wheels and not actually hovering, the Hoverboard has become one of the most-wanted gadgets of 2015. The self-balancing boards that let the rider glide along while standing perfectly still, giving the impression of moving like a vampire, have become an international craze. 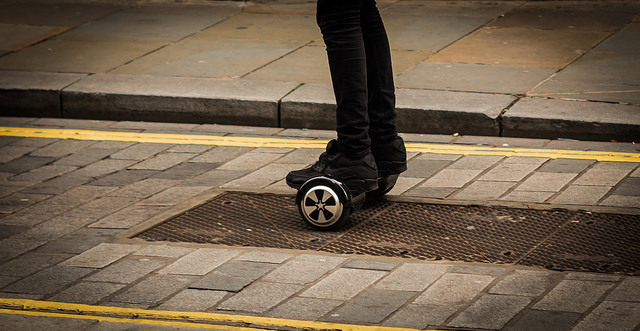 They became infamous when hoverboards were made illegal on UK streets and someone has just been charged with using a hoverboard as a getaway vehicle, which has brought the two-wheeled wonders to the attention of an even broader market and probably created even greater demand. Why is this relevant to a digital agency like Narrative Digital Agency? Because, we believe you can’t cut corners on your tech and doing things on the cheap has risks that are hard to predict. you can’t cut corners on your tech. Like cheap hoverboards, you are taking a risk using cheap web development. While there are plenty of people willing to sell you cut-price versions of the quality services that we offer they are, ultimately, preying on their customer’s naivety to make a quick buck. It isn’t necessarily a deliberate attempt to rip-off customers because, quite often, the person selling it to you is just a chancer – a digital barrow-boy – who is innocently operating under the misapprehension that they are doing you a favour. More often than not they don’t understand the significance of the industry standards, why (or even if) they exist, and see them as a barrier rather than a benchmark of best-practice and quality control. Those offering cut-price digital services are often totally unaware of the risks they’re exposing their customers to. If Amazon pulls your online store for selling substandard hoverboards, you lose your sales. Similarly, search engines like Google will rank your site lower if it doesn’t meet their standards. A poorly build hoverboard will crash & (literally) burn while a website that isn;t customer-focussed, poorly thought through and cheaply built won’t work properly either, costing you potential customers. Someone knocking out a few blog posts for you or updating your Facebook page might seem like a good idea but if it isn’t achieving anything from an SEO, brand positoning or lead-generation point of view it’s a waste of money, just-like buying a cheap hoverboard that breaks and just sits in the cupboard taking up space. You’ve spent money on something and aren’t getting any pleasure from it. I guess what I’m saying here is that cut-price isn’t the same as value for money and, while you can get lucky and get everything you want from a cheap alternative, if you want to be taken seriously you have to go with professionals.